Oak is not frequently used to make garage doors primarily because of its weight. As oak is so heavy it can make it difficult to produce oak up and over garage doors or oak sectional garage doors. Nonetheless, it is possible to produce oak garage doors in the various types and styles described below. 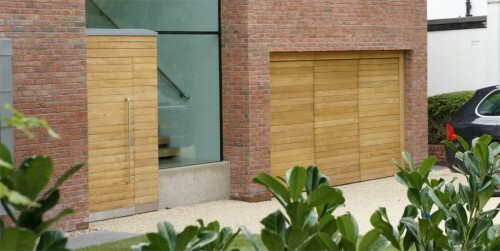 Silvelox oak garage doors – Silvelox garage doors are made up of laminated Multi-ecowood. Only the top layer is oak. You can also choose from a variety of other woods. This a much more stable product than a solid oak garage door. Due to the type of construction, choosing oak in the Silvelox range does not restrict at all the size or design. This makes Silvelox garage doors our preferred choice for oak garage doors. The Silvelox garage door that we supply is the Overlap which is a trackless sectional garage door . There are no unsightly ceiling tracks intruding into the garage roof space that are associated with traditional sectional garage doors. 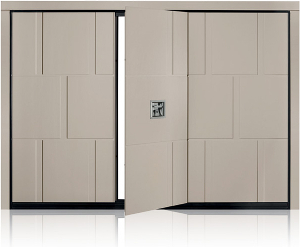 Overlap is also superior to all other types of garage door in terms of insulation and choice of designs. There are 12 standard designs to choose from, all available in oak and the option to have your own bespoke design. Oak side hinged garage doors – as oak side hinged garage doors do not need to be balanced like other types of garage door e.g. up & over, oak is as suitable as any other timber to make side hinged garage doors. 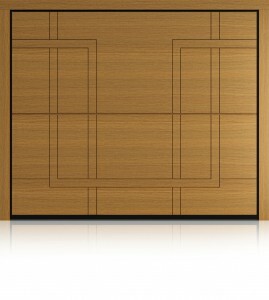 Oak side hinged garage doors can be made in a wide range of styles and heights. However, as with all side hinged garage doors, the restriction is on width. It is not practical to make side hinged garage doors more than 8’ wide. It can overly stress the hinges and joints. Also, even with door stays, the leaves can be vulnerable to being caught by the wind. This applies to all side hinged garage doors and not just oak. Oak up & over garage doors – up and over garage doors in oak are our most frequently requested type of oak garage door. 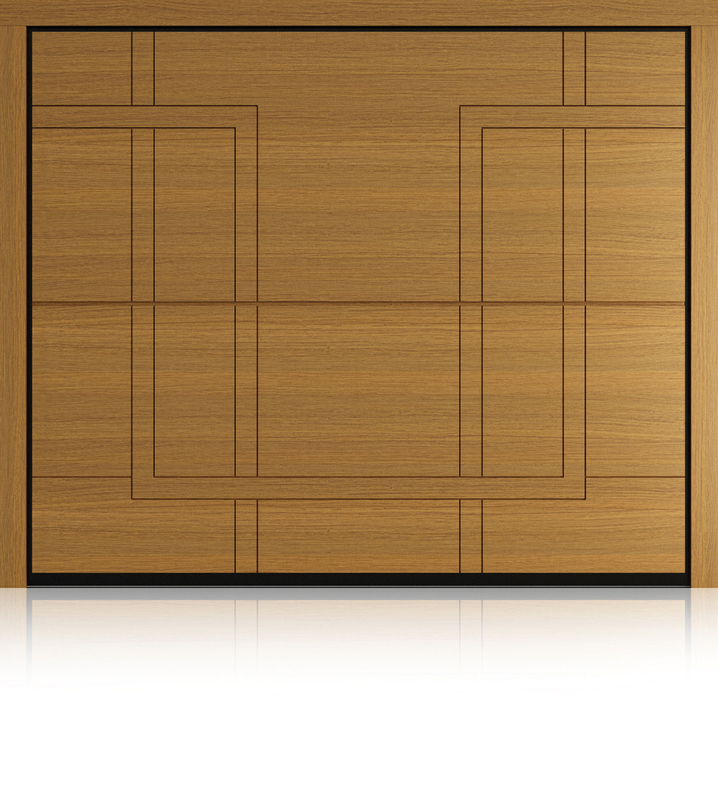 As such specialist timber door manufacturer Woodrite have recently created a small range of oak veneered doors with solid oak mouldings. These doors are traditionally styled and would look superb on any period home. If you are looking for something more contemporary the best way for this to be done is with an Open For Infill (OFI) type garage door such as the Novoferm OFI Magnum. An OFI comes as the chassis of a garage door leaf but with no panel. The panel can be made however you wish. You can arrange this or we can use one of our preferred joinery manufacturers. What restricts oak up and over garage doors is the maximum weight they can carry. The use of an OFI keeps the overall weight much lower than with solid oak garage doors. It can be difficult to strike a balance between using oak boards that are thick enough not to curl or warp whilst not exceeding the maximum infill weight of the door. This can affect the styles which can be used, though this is generally only an issue on larger doors. We recommend using the Novoferm Novomatic 803 S garage door operator with oak up and over garage doors.